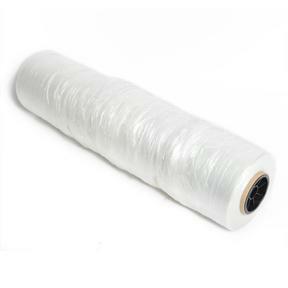 Cushion Wrap Silk Film 54"
Cushion Wrap Silk Film is a noiseless plastic film that makes cushion stuffing easier. Wrap the silk film around the cushion foam and slip into the fabric cover. The Cushion Silk Film is specially formulated to be silent under decorative or contract fabrics and also acts like a moisture barrier for outside applications. Use Cushion Wrap Silk Film with a vacuum to shrink the cushion foam by up to 70% before inserting into the fabric cover. This makes for even easier foam installation and ensures the foam fills the cushion evenly, even the corners. Cover and tuck the film loosely around the foam and insert a vacuum hose into an open end of the film, directly onto the foam and turn on. The vacuum's suction will compress the silk film over the foam and shrink the foam. Turn off the vacuum and the foam will expand to it's original size. Q: is this completely silent? because I just bought a roll from a different manufacturer and spent 140.00 and found out its noisy and sound crinkly when you sit on it very disappointed in the product so now I am looking for more. Yes, this silk film is completely silent. Before you buy we can send you a sample if you wish. E-mail us at samples@jtsoutdoorfabrics.com with your mailing address and we will get that out to pronto. Q: how wide is this? Q: What is a running yard? A running yard is the width of the fabric by 1 yard long.